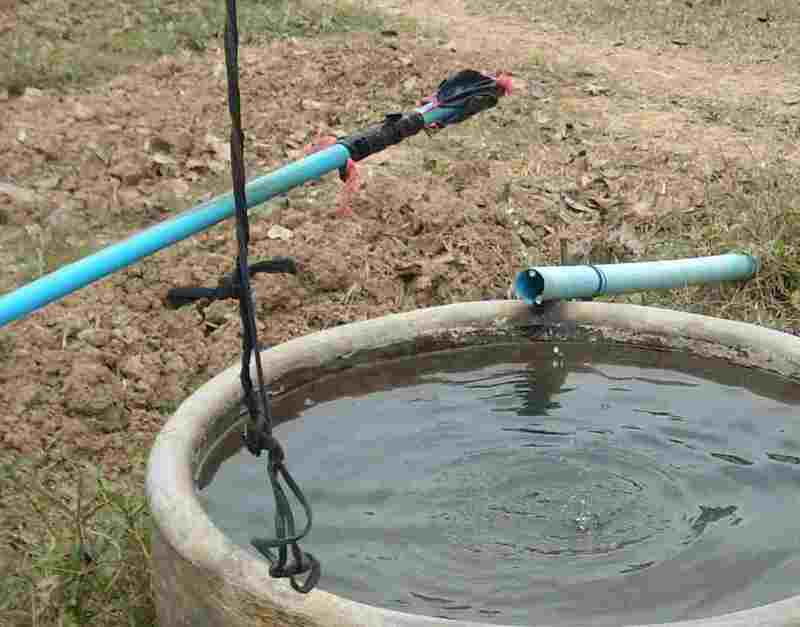 The water pump described here is cheap to make, easy to maintain and very, very simple. The principles making this pump work have been known for a very long time. 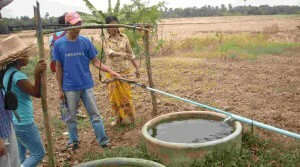 Rus Alit of Bali, Indonesia has been a key person in developing this to ensure it is easy to make in villages. Recently we saw a modified version, operating in remote Cambodia. Enjoy the pictures and explanation! Don’t just read about it, make one! Here is the whole pump with explanation added, then some photos. and the two valves working together, to lift water. 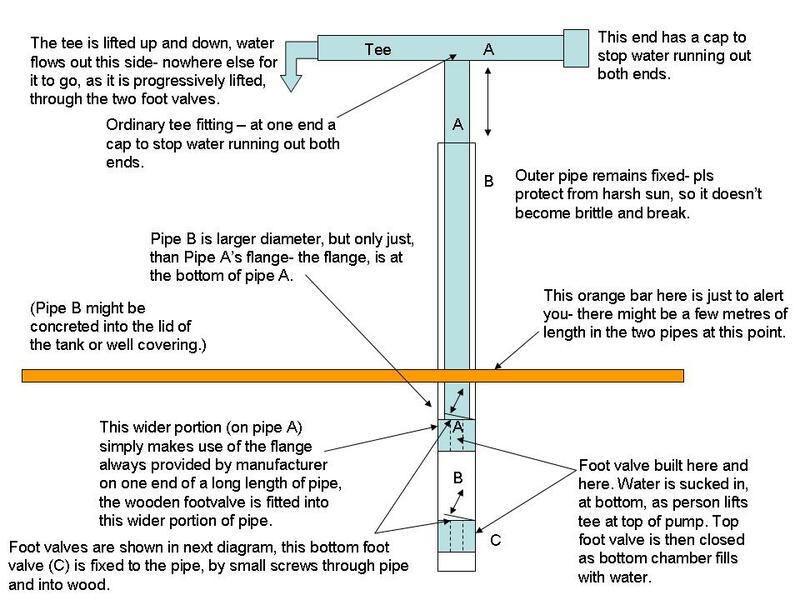 How the two foot valves work, one in outer pipe and one in inner pipe. 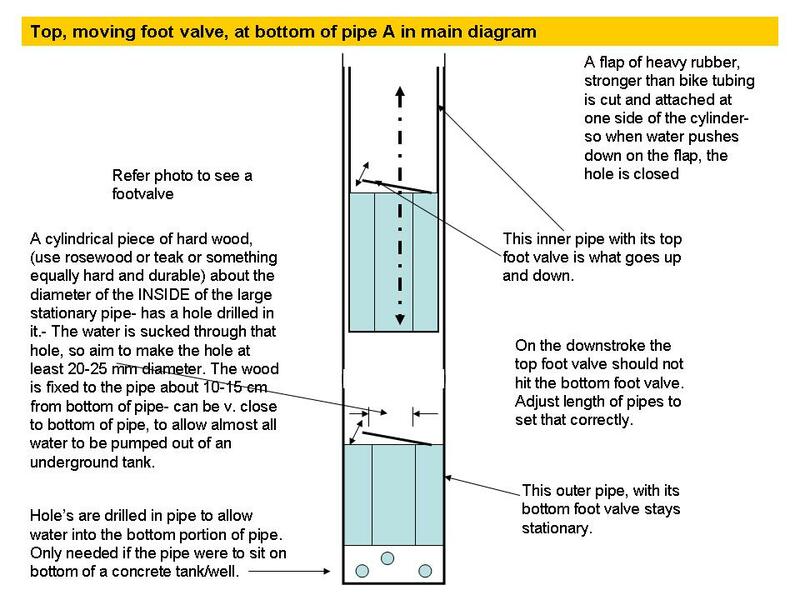 and here is a foot valve – make sure the valve rubber is strong enough to support the weight of water above it. Rus Alit and Mark in Bali, testing the two pipes, with two foot valves- just to show how simple it is to set up. 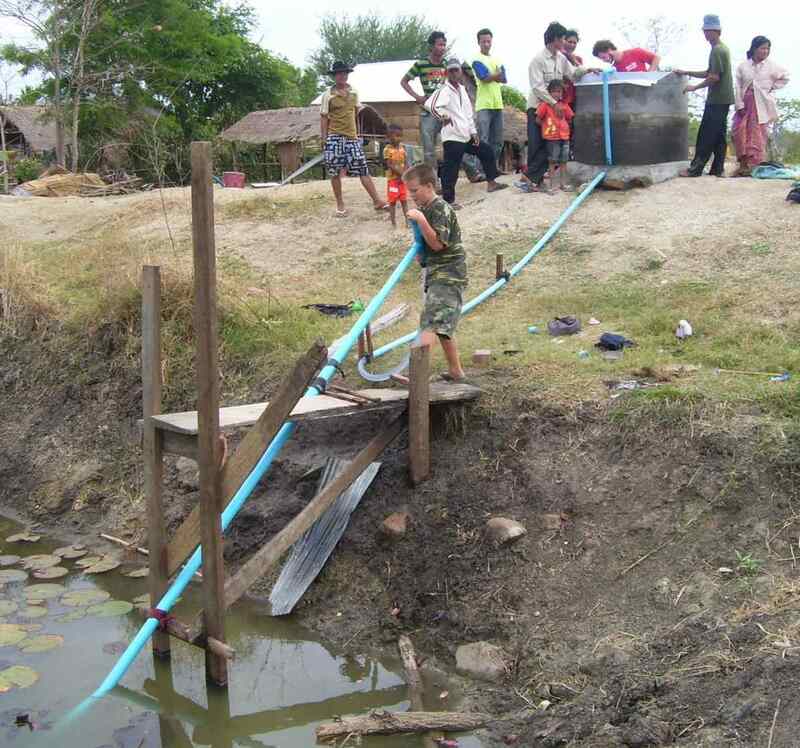 Here is the whole pump being used in Cambodia. Note that the tee has had a flexible hose added so water is pumped into the flexible hose and then on up into a tank. From the tank, gravity could be used to take water to gardens or a home. A Cambodian innovation is shown below. 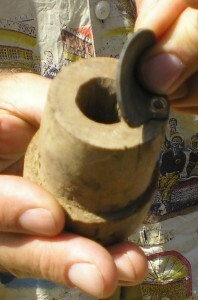 One wooden foot valve is replaced with heavy plastic and car tubing tying it all together. The pump has been pulled apart to show how it works. Push the plastic bag cover ed pipe end into larger pipe and as the left hand (inner) pipe is pulled, the bag opens out and catches water. 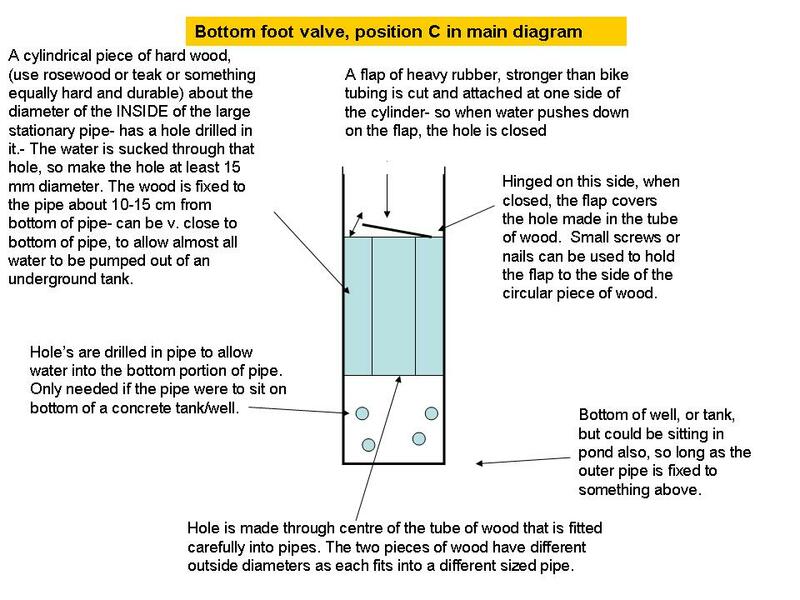 A long stroke is possible, and remember the long outer pipe going into the pond or river (on the right) still needs a wooden foot valve. The system as seen in Cambodia. There are other options that can be used. For example in other places a rope and washer pump might be the best option. Beware of using a pump that requires petrol, diesel or electricity. The high costs of energy (and the challenge of maintenance) might make it uneconomic for many of the farmers you are seeking to work with. water pumps are environmentally friendly and low maintenance. ecology and technology of the hand. Be great if you could make it to Bali again. I will be there in September, December and january. My name is Dave Askin, and I was in Cambodia with Youth with a mission. The team went to Rus Alit in Bali, but I was not able to go with them. So, this does not get you in contact with Rus Alit, directly. I am sorry about that. However, this should get him. rus_alit@yahoo.com. I trust this helps.